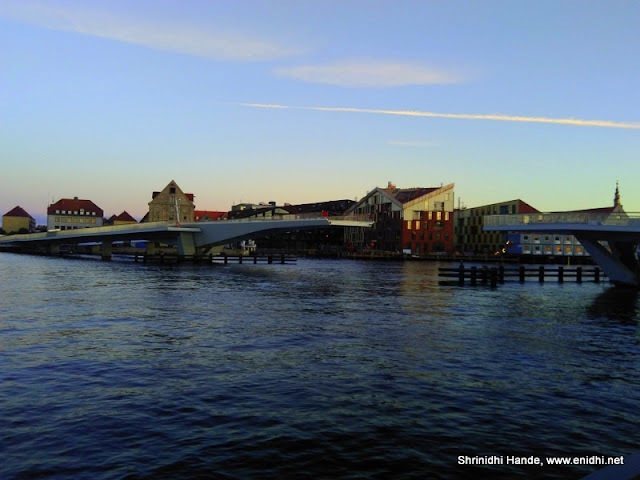 Copenhagen's latest attraction is a new bridge named Inderhavns Broen (Inner Harbor Bridge) that connects Nyhavn to the islands across the canal, providing easier access to The Opera House, Noma and Christiana area. This Inderhavns Bridge finally opened to public in july 2016, after 3 years delay. What's so interesting about the new Inner Harbor Bridge of Copenhagen? 1. For cyclists and Pedestrians only: The new Inner Harbor Bridge is for cyclists and pedestrians only. Cars and buses will have to take longer, conventional route but no one is complaining. Majority of Copenhagen residents move around in public transport and in bicycles so they are happy about the bridge that cuts the travel time across the canal. Earlier options were to take a water taxi or metro or a longer route. 2. Retracting bridge: The Inner Harbor bridge has enough height for regular boats to sail under it unaffected. But it can also retract on both sides to let bigger ships pass through. Two cantilever beams extend at the centre of the bridge can move back in between the two fixed paths. (Most bridges that let bigger ships through usually bend upwards). Unfortunately I couldn't figure out of there's any specific time during which bridge will retract and obviously couldn't sit and wait there whole day waiting for that to happen. 3. Nicknamed Kissing bridge; Because the two sections move in and interlock, the bridge has been named "Kissing Bridge" Below photo shows the kissing part. 4. Easy access to Noma, Opera House etc. With the new walking bridge, Noma, world's No.1 restaurant is now more accessible than ever (to reach I mean, not to enter, as the reservation there reportedly costs 400 USD onwards as per a friend). Tourists visiting NyHavn can walk a bit more and get better view of the city from the other side of the bridge. Read all Denmark posts here.